There’s a simple sales rule that says, “People do business with others who they know, like, and trust.” You’ve likely heard this before, right? This rule is especially true for online coaches and personal trainers because we are selling ourselves. We’re not offering a tangible product, something people buy and use. We’re selling a relationship. People will only invest money in a relationship if they know, like, and trust you. The easiest way to develop strong “know, like, and trust” with your prospective clients is through automated emails. In fact, there are 4 strategic emails that will warm up your prospective clients so that making the final sale is a piece of cake. 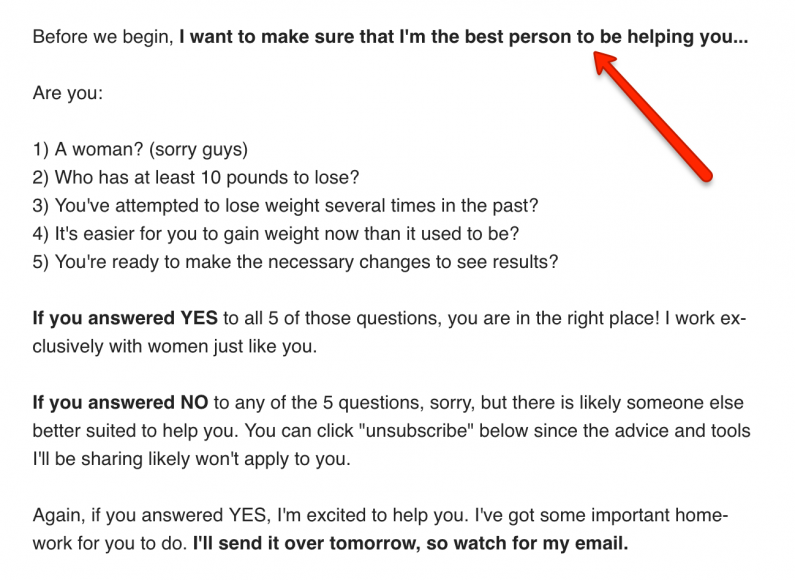 The emails I’m about to show you are the exact ones I use with my own online fitness business. Of course, your emails should be tailored to your audience, but the strategy behind each email stays the same. While it’s tempting to build a big email that includes any contact you can find, a big list is pointless if it doesn’t lead to sales for you. Instead, you want a targeted list, one that’s full of legitimate prospects who you would like to work with. “The Screener” is an email that eliminates people who are likely never going to buy from you, while at the same time, reassuring your true prospects that they are in the right place. Notice how clearly I reinforce who belongs in my tribe and who doesn’t? Yes, this email results in some unsubscribes from my list, but that’s okay. I want the subscribers who choose to stay to feel as though they’re part of an exclusive club. They now know that my sole purpose is to help people just like them. This email is designed to establish your expertise and to get your prospects excited about what’s coming next. 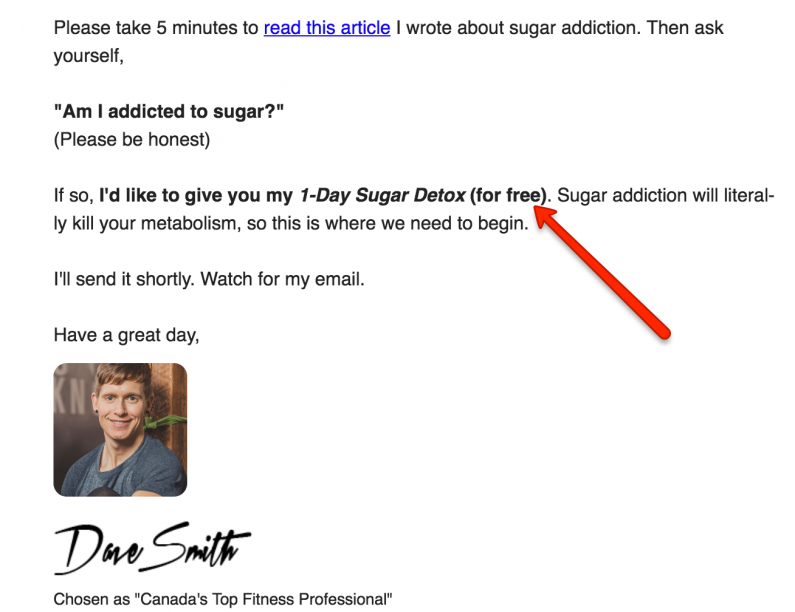 I know that my clients often struggle with food cravings, so this email focuses on sugar addiction. I explain why it’s such a problem and what sugar is doing to their body. “The Tease” offers some valuable content (i.e. about sugar addiction in this example) that will strike a nerve with your audience. They see that you understand them, and that you have the experience to help. Finally, it promises a real solution that’s coming the following day. They’ll just have to watch for your next email in order to get it! The third step in this series of automated emails delivers on your promise. You said you were sending them a gift, so here it is. Why are you giving them this gift? That last purpose is the most important. You just gave a free gift to someone who could legitimately use it. You didn’t ask for anything – you just gave because you care. The Law of Reciprocity tells us that this person will feel obligated to do something nice for you. That reciprocal favour comes into play tomorrow. One important note: Make sure your free gift offers real value. 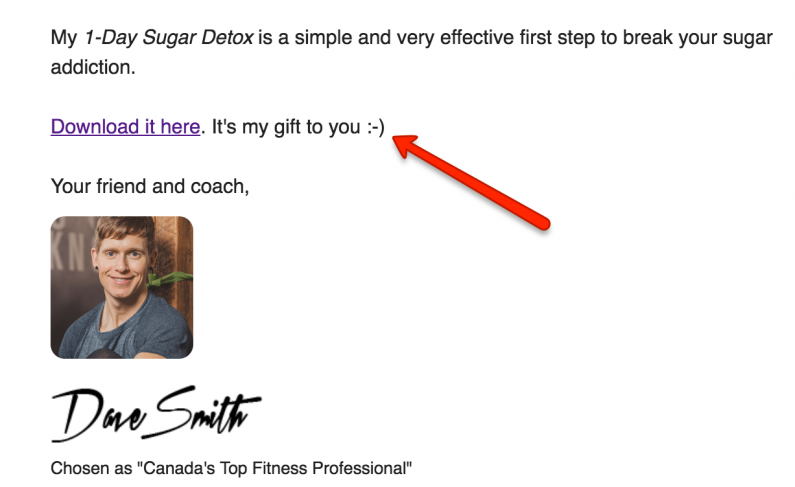 In my example, I offer a 1-day sugar detox plan that leads them through a step-by-step approach to reducing their sugar cravings. My clients LOVE this. What would your ideal client absolutely love to get from you? 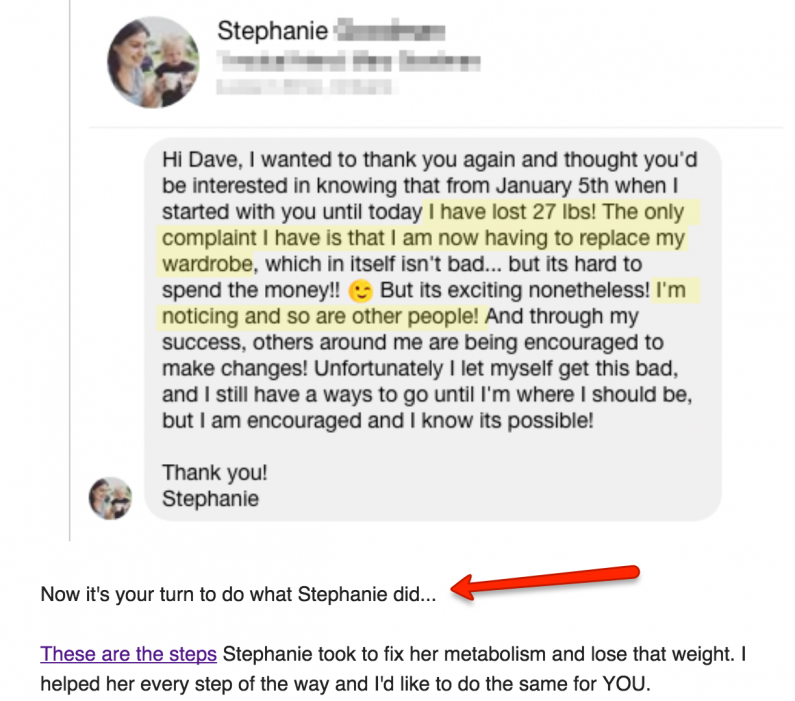 After sharing a success story from one of my past clients, I lay out the very simple steps they need to take in order to see the same results for themselves. In my case, I send them to an automated webinar, but you might send your leads to a sales page, an order form, or a place where they can schedule a consultation call with you. At this point, they are ready to buy, so your job is simple to make the buying process as easy as possible. Email marketing is a powerful way to automate much of the selling process. You can “warm up” your leads without lifting a finger, and even if they don’t buy from your fourth email, you’ve positioned yourself to be the person they turn to when they are ready to hire a coach. Now it’s your turn to begin writing your own 4-part email sequence that will help grow your online fitness business. Dave Smith is a professional fitness and weight-loss coach who was chosen as “Canada’s Top Fitness Professional” in 2013. He shares health and weight-loss tips through his blog and podcast at makeyourbodywork.com and helps fitness professionals grow their onlines businesses at onlinetrainersfederation.com.